The combination of acupuncture and physical exercise may be an effective option in the treatment of frozen shoulder. The term "frozen shoulder" is used to describe a variety of conditions that cause pain and limit the range of motion of the shoulder joint. Most commonly caused by inflammation of synovial tissue or thickening of synovial fluid, frozen shoulder occurs mainly in middle-aged people who have a history of shoulder injuries. 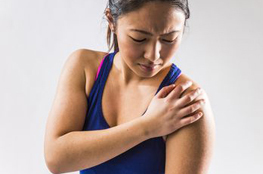 In some cases, the pain associated with frozen shoulder can be severe enough to disturb a person's sleep. In others, the shoulder can not rotate properly, resulting in difficulty moving the affected arm out and away from the body. Upon diagnosis, the initial stages of care are aimed at reducing inflammation and increasing range of motion. Various treatment methods have been devised, including anti-inflammatory drugs, ultrasound, heat, massage, stretching and isometric exercises. Steroid injections and nerve blocks have also been employed , but the effectiveness of these therapies can vary greatly . Several studies have reported that acupuncture can successfully treat frozen shoulder, but the majority of these studies have not been of the randomized, controlled trial (RCT) variety. A study using the RCT format compared the use of acupuncture (along with exercise) to exercise alone in a small group of frozen shoulder patients. The study, published in the Hong Kong Medical Journal, found that patients treated with acupuncture and exercise demonstrated "significantly greater improvement" on shoulder assessment tests than those using just exercise, and suggests that acupuncture could be useful in cases where more conventional therapies have been unsuccessful. Researchers see promise for the use of acupuncture in conjunction with exercise to treat frozen shoulder. One study found the combination of acupuncture and physical exercise may be an effective option in the treatment of frozen shoulder. Studies provide additional data on the potential role of acupuncture in the treatment of frozen shoulder, particularly for those patients not responding well to conventional therapy.